On the way into the city, stop at the Visitor Center (375 Meeting Street) to see the orientation film, Forever Charleston, a 36-minute introduction to the city’s long and distinguished history. Park the car at the lot on the right-hand side of Meeting St, just after its intersection with Queen St. Exit at Meeting St and take a left to Cumberland. Take a right on Cumberlandand note the Powder Magazine at 79 Cumberland. It is reputed to be the oldest public building in the Carolinas (1713). It was within Charleston’s old City Walls which once was the area bounded today by Meeting Street, Cumberland Street, East Bay Street and Water Street, in this, the oldest part of the city. Continue down Cumberland and take a right onto East Bay Street, then a left on Vendue Range (just south of this intersection, slaves were sold at an outdoor public auction block). Continue east to Waterfront Park, which once was the launching area for almost half of Colonial America’s exports until the advent of steam-powered ships (which required deeper harbors). Walk south through the park and turn right on Mid-Atlantic Wharf. Turn left onto East Bay Street and continue southward. Notice the Moorish Revival Architecture of #141 East Bay. The Old Exchange Building is at #122 EastBay. This was where imports and exports were processed before distribution and was also where the Declaration of Independence was first read to cheering townspeople in 1776. This building also served as a dungeon, a meeting house, and city hall, and was where President George Washington was lavishly feted during his visit in 1791. Continue on East Bay to “Rainbow Row,” a cluster of waterfront tenements (#’s 79 -107 East Bay) which were restored in the 1920’s. Continue southward to the Battery. When you reach the intersection with Atlantic Street, cross the street to the water side and climb the steps to the elevated walkway (known as the High Battery). 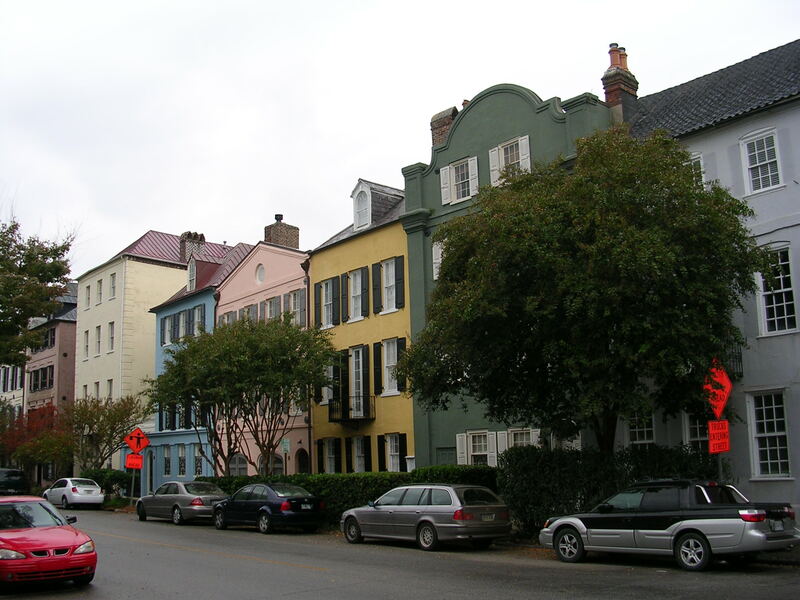 Stroll south along the High Battery noticing the many antebellum homes across the street. The Edmundston-Alston House (1825) is at 21 East Battery. Prince Charles of Wales and the Emperor of Japan were entertained at the William Roper House (1838), #9. The “hot pink” house at 5 East Battery (1848) was built by John Ravenel (whose brother, William, owned the house at #13). Stand near the plaque at the end of the elevated walkway and look out at the harbor. The plaque will point the way to Fort Moultrie, on Sullivan’s Island (the island with a lighthouse on the left side of the harbor). The British attacked this fort six (6) days before the Declaration of Independence was signed, in 1776. Far out at the entrance into the harbor is the flat shape of Fort Sumter, where the Civil War began on April 12, 1961. On Morris Island, the land mass to the right of Fort Sumter, the 54th Massachusetts Regiment, commanded by Col Robert Shaw, suffered heavy losses in an attack on a Confederate battery — the basis for the film, Glory. Cross the street to White Point Garden which displays several interesting artifacts: Keokuk Gun, in the northeast corner, was salvaged from a Union ironclad which attacked Charleston harbor in 1863; two Confederate Columbiads, part of Fort Sumter’s arsenal, on either side of the walkway at the east edge; the Capstan of the Maine. Walk west and then head north on Meeting Street. Note the two windows on the south end of #2 Meeting St, designed by Louis Comfort Tiffany. The Calhoun Mansion (16 Meeting St) (1876) was used in filming the miniseries, North and South. It is the city’s largest single-family residence and contains 35 rooms, each with a fireplace. Next door (18 Meeting St) is the Thomas Heyward House (1803). He was a signer of the Declaration of Independence. Note the three (3) types of columns on the house at #26 Meeting: Doric on the ground floor; Ionic on the 2nd floor; and Corinthian on the top floor. Take a left onto Lamboll Street, then right on King Street. The O’Donnell House (#21 King) is an Italianate mansion built for his fiancée who was elsewhere when the house was completed, following the Civil War. The Miles Brewton House (#27) is one of the finest Georgian (1769) residences in America. British Generals Clinton and Cornwallis stayed here when English forces occupied the city. Next, take a right onto Ladson Street and go back to Meeting Street. Head north on Meeting St, up to the Nathaniel Russell House (#57 Meeting). It is noteworthy in the United States as an excellent example of Federal architecture. Walk back a few steps and turn left onto Water Street, then take another left onto Church Street. Numbers 56-58 Church Street are known as the James Veree Houses, named after the carpenter who built them. At the Thomas Rose House (#59 Church), Doctor Joseph Ladd’s ghost still reputedly haunts the staircase. The First Baptist Church (at #61) was designed by Robert Mills, architect of the Washington Monument. The Richard Caper House (at #69) is a “double” house. Peek into the garden to the left of the house. Walking north, you will reach the Heyward-Washington House (#87) (1772) where George Washington stayed during his visit to the city in 1791. Numbers 89-91 Church Street are known as “Cabbage Row” because residents used to advertise and sell produce on the street. Just to the north, take a left on Elliott Street, then right on Meeting to its intersection with Broad Street. Here are the famous “Four Corners of Law”: City Hall (representing Local Law), is said to be the oldest in the United States, is at the northeast corner; Charleston County Courthouse (representing State Law) is in the northwest; the US Post Office and Federal Courthouse (representing Federal Law) occupies the southwest corner; and St Michael’s Episcopal Church (Religious Law) is in the southeast (it’s bells were cast in London in 1764). Take a right on Broad Streetand left onto Church. On the left, at 135 Church St is the Dock Street Theatre. It used to be the Planters Hotel, where the drink, Planters Punch, supposedly originated. Across the street is the French Huguenot Church (#136), founded by Calvinist Protestants who fled Catholic France in the late 1600’s. The congregation here dates back to 1687. 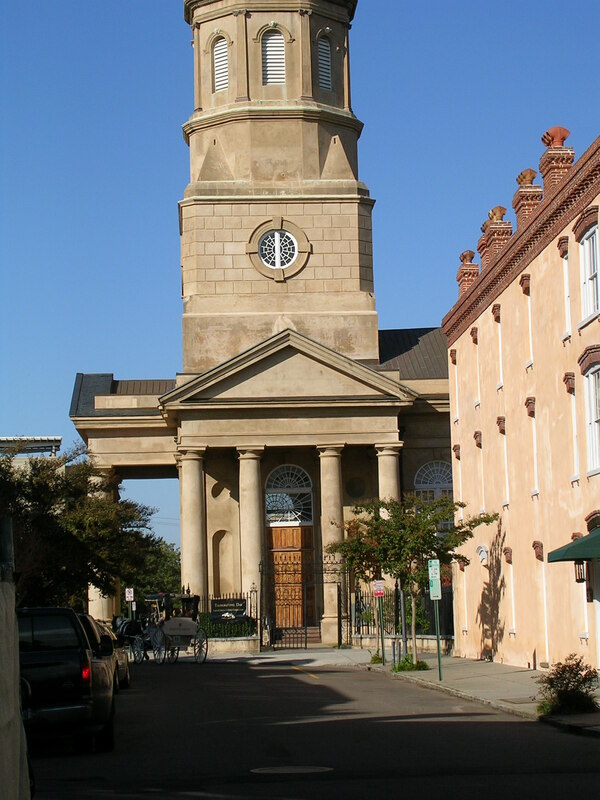 Further north at 146 Church Street is St Philip’s Episcopal Church which was Charleston’s first congregation (1680). The graveyard contains the remains of colony-founders, Edward Rutledge and Charles Pinckney, as well as statesman John C Calhoun. Continue north to Market Street, then left to Meeting Street. Check out the shopping at City Market, behind Market Hall (188 Meeting). Stop for lunch or a snack at the Southend Brewery & Smokehouse, 161 East Bay Street, at the corner of Queen and East Bay..
up. 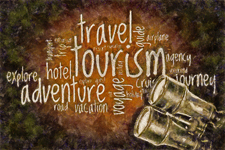 This site is something that’s needed on the web, someone with some originality!